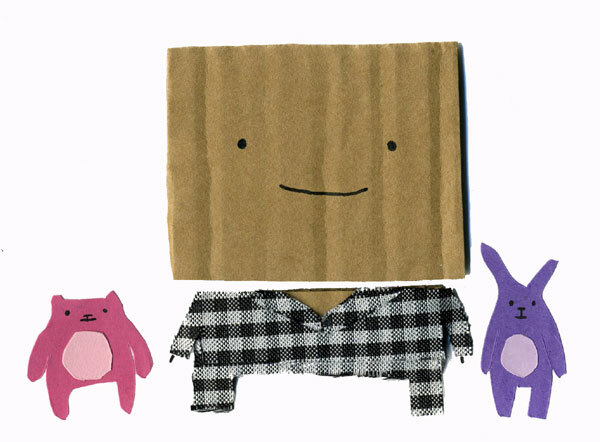 My Cardboard Life » BFF-FM! Pyjamas! Puppy update! I was on BFF-FM last Sunday. BFF-FM being the We Are Words + Pictures Radio show hosted by sassy bearded journalist Michael Leader. It was a fun time, and I managed to mention my new leopard print jumpsuit! If you want to listen to it, here is an appropriate place to do so. It’s about time we decided once and for all what Colin’s Puppy should be called. I’ve rounded up the most suitable name suggestions and made them into a poll on the My Cardboard Life Facebook fan page. You can vote on that here. Other news: The next convention I’m appearing at is APE which is less than a month away now. I’ve got a lot to do before then! Got a feeling it’s going to be tricky to make five new comics every week during October, so I might have to cut it down to three a week for a while, or have some kind of break for a couple of weeks. I’m not sure yet. Oh and by the way, that picture of Colin in his pyjamas is completely unrelated to anything. THERE IS NO PYJAMA NEWS! I tricked you! Philippa I am outraged! No Pyjama news? Oh, the deceit! I think your characters would be perfect for a pyjama design and I think you should look into it. It’s not like you have anything else to do within the next month is it? Also, where’s the name Dogwell in this poll? Outraged! There’s Pajama Forest. That’s news. I like that commic too. no pyjamas!?! that was the only reason I read this thing! okay, okay, that thing about the leopard jump suit was worth it. No pyjamas?! Oh the shame……….